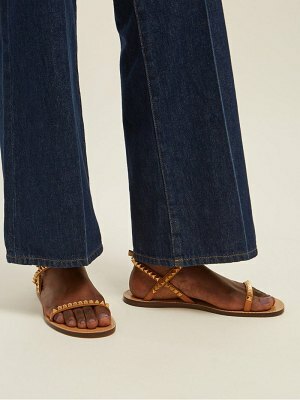 Gianvito Rossi metallic napa leather sandal. 0.3" stacked flat heel. Open toe; lace-up front. Wavy, strappy upper. Lightly padded footbed. Smooth outsole. Adjustable self-ties around ankle. "Hydra" is made in Italy.